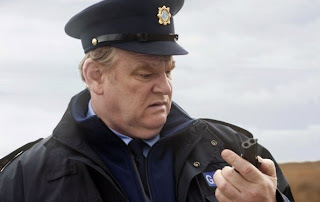 Brendan Gleeson plays Constable Gerry Boyle, he is a great cop, but is not without his vices. He drinks, cusses and says all the wrong things on the job, but deep down he is a decent guy and his heart is in the right place. He has just been assigned a new partner named Aiden McBride, who regrettably has a very bad first day on the job, from the seemingly cult murder of a local to the arrival of an FBI agent on the trail of a massive drug shipment ,things go decidedly downhill from there. The Guard is a thriller with elements of black comedy and is a movie driven heavily by the characters and their choices; it isn’t really about the plot, more a platform for some superb performances by some very talented actors. Brendan Gleeson is the stand out, channeling a little of his character from Lake Placid with his borderline sarcasm and laid back approach to police work. Don Cheadle also puts in a great performance as the fish out of water FBI agent. The film is beautifully shot in cinema scope with some great use of the Irish countryside; the writing is superb with particularly well written and often hilarious dialog and an amazing confidence in its characters and story. The Guard would easily rate as one of the most entertaining films of the year, if not one of the best films in general.